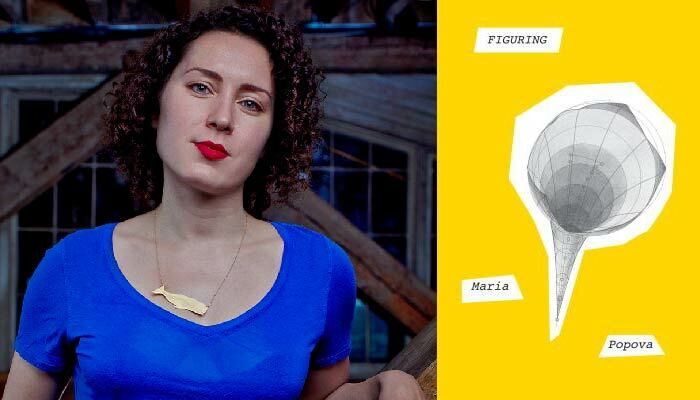 Maria Popova is the author, curator, and brain child behind the blog Brain Pickings: a cultural treasure trove of the thoughts, letters, and life’s work of some of history’s greatest thinkers. Most Brain Pickings articles have titles like “How to Grow Old: Bertrand Russel on What Makes a Fulfilling Life” and “Zadie Smith on Optimism and Despair.” Spanning centuries, her articles delve into a person’s writing to find the fundamental truths that make them who they are. Reading a Brain Pickings article is like being introduced to an acquaintance and discovering that you actually have more in common than you think… Except that these acquaintances range from Rilke to Einstein. I’m an avid Brain Pickings reader, which is why I was so excited when, after more than 12 years of running the website, Popova finally wrote a book. That book is FIGURING, and it did not disappoint. If a single Brain Pickings article is an introduction to a person’s intellectual work, then FIGURING is a spider’s web contextualizing their ideas not only in their lifetime, but against the backdrop of human history. It sounds like a lofty task, but no one is better suited to make those connections than Popova and her voracious curiosity. FIGURING opens on Johannes Kepler in 1617. Like Copernicus and Galileo, Kepler believed that the earth revolved around the sun, a dangerous idea during a time when “God [was] mightier than nature, the Devil realer and more omnipresent than gravity.” When the book opens, Kepler has already plotted the orbital paths of several planets, and discovered that they travel not in a perfectly symmetrical spheres, but in elliptical orbits. He has predicted the existence of a universal force holding the planets in place, decades before Newton discovered gravity. He has also penned the first work of science fiction, in which an interstellar traveler lands on the Moon and meets moon-beings who believe that the Earth revolves around them. From this one extraordinary life, Popova’s curiosity spins forward in history, leaping from scientists to poets and back again, ricocheting across the centuries. She often pauses the narrative in order to show how an idea has passed between thinkers, how it’s been echoed again and again over time. Reading FIGURING is like running your finger along a spider’s web, and suddenly understanding how each point of connection splinters into the others. Through Popova’s careful guidance, the reader begins to see the ways we are all connected, across history, across gender, and across disciplines. She is especially fascinated with the intersections of art and science. Her choice of people to focus on speaks volumes: She begins with Johannes Kepler, a man who used science to inform his fiction, and ends with Rachel Carson, who personified birds and marine life in order to make an impassioned plea for wildlife conservation. This call for the union of truth and beauty rings throughout the whole book. No person she brings into focus is solely an artist or a scientist, but rather a multi-faceted commingling of the two. FIGURING is a masterwork of historical scholarship, but also a moving portrait of the human condition. In it, we find that the lives of the past may not have been that different from our own. These people, who come to life through Popova’s careful renderings, are people we could have known, even as they were championing ideas that would define their place in history. Some are still widely known, others infinitely more obscure, but together, they form a portrait of our collective consciousness. Love, the hidden thread that binds one human life to another, is also a connecting force in FIGURING. Between each relationship, whether between couples or through the veil of time, is a force that connects each and every person in the book. Their relationships and the ones that follow are the backbone for the spread of ideas. In looking back, we see that we have always been fickle, unknowable beings, and Popova’s job, as she sees it, is simply to shine a light on the ways we are similar, and to marvel at the parts of ourselves that remain unknown.